Enjoy refreshed cleaner air with a Bionaire dual filter cartridge. GermGuardian FLT9400 HEPA genuine replacement filter for AC9400W, is a multiple level cleaning system that includes a HEPA filter, activated carbon filter and pre-filter screen that all help to improve indoor air filtration. This is a GENUINE GermGuardian filter. It is important to only use genuine Guardian Technologies replacement parts to maintain product performance. Breathe cleaner with the Roomaid portable air filtration system by Amaircare. The Roomaid Snap-in replacement HEPA canister fits the Roomaid Units sold on The Home Depot (see parts 20001301 and 2001302). This Kit comes with and easy to install replacement HEPA Filter Unit in a Slate housing. Now you can continue to clean your air and have years of worry free use. JAG Plumbing Products, based in Ontario Canada, is proud to be the distributor of this Canadian Manufactured high quality air system. Protect your family from dust, pollen, bacteria, animal dander, attached viruses, cigarette smoke, radon daughters and more. This Kit provides a 3 stage V.O.C. filter (Volatile Organic Compounds) that removes hazardous V.O.C.s that may off-gas from things made with chemicals such as cleaners, paints, carpets, and furniture. The XPOWER 13" x 13" Activated Carbon Filter now equips the X-2480A & X-2580 Mini Air Scrubbers to capture a wide variety of volatile organic compounds (VOCs), including soot and smoke, food odors, fumes from paint and paint thinners, sewer odors, and many other compounds. 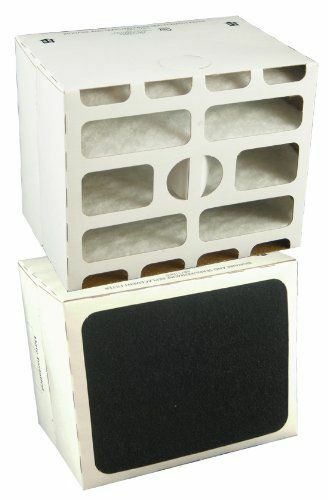 The 1.4" thick Professional HEPA Filter captures contaminants such as bacteria, allergens, mold and even 0.3 sized sub-micron particles at a rate of 99.97%. Several pre-filter air scrubber stages ensure a long life of this filter. Replace as needed when indicator light illuminates and other filters have been checked for blockages. Dual Filter Cartridge for various F-models Enjoy refreshed cleaner air with a Bionaire dual filter cartridge.